In 1962/3 the Kenyan State was arising to its new found and hard fought democracy. It was an aspect of dedication and transformation of strategy. We have come to see through chronicles of history how the founding father recounts and dedicatedly handles government and political business. With his army of The Court Jester – Mbiu Koinange, Kareithi the political supremo and other members who he held dear to driving the court agenda. Most notable alongside him on State functions were his sons and his zeal to show them how business is ought to be done — what we call mentoring but it is the lost art of fatherhood. Upon “Closure of Kenya’s Eyes”, Daniel Toroitich Arap Moi took the helm and walked in the ways of predecessor under the philosophy: Nyayo. At the rise of multiparty democracy, Moi found a successor in the young Uhuru Muigai, the son of Mzee Jomo Kenyatta just back from the United States. In 1997 he was elected Kanu’s branch chairman and subsequently nominated to the National Assembly after 1997 sabotaged election for Gatundu MP costing him the seat. Moi held Uhuru dear. Though considered Moi’s project with limited knowledge and skills, Moi appointed him chairman of the Kenya Tourism Board in 1999 and two years later, elevated him to minister for Local Government. Following this, he was elected as one of the four national vice chairmen of KANU in the same year. 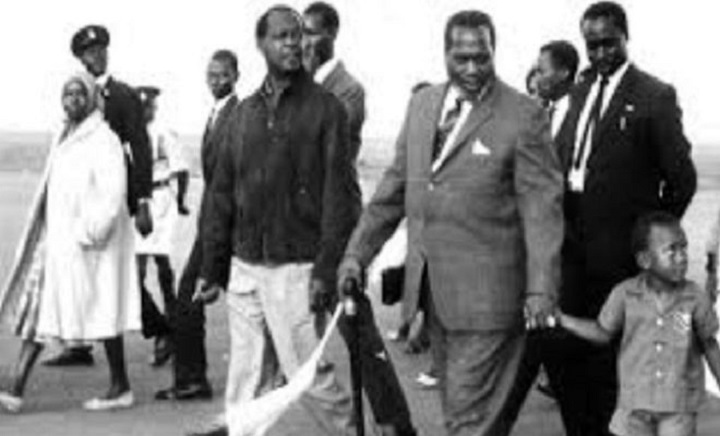 Uhuru has grown to walk in the ways of his political fathers — Moi and Mzee Jomo Kenyatta. Uhuru’s fidelity to the law and desire to take the country to the next level is evident in how he has managed to bring back scholars who had exported their expertise to foreign lands to come back and help build the country. The composition of his cabinet is the testimony of how non-tribal he is which has led to the revival of iconic industries like Rivatex which had been left to rot away. His keen interest in providing the best environment for the growth of the private sector is seen in his commitment to expanding infrastructure and one of the best examples is the Standard Gauge Railway (SGR) which has opened up the coastal tourist counties hence a booming tourism sector — both local and foreign. The SGR trains are always fully booked both ways and other private owned entities like Bonfire Adventures only help to paint a positive picture of what Uhuru has done to the private investors who also benefit from the infrastructural development he has initiated. From luxurious hotels to informal sectors like those who brew Mnzai drinks and other vendors, Uhuru has done it. For long-term and sustainable projects and development, there has been the brisk replacement of old-fashioned timber poles with concrete power poles which are more durable environment-friendly. The allocation of recourses in a timely fashion and the subsequent recognition of counties as independent but part of a nation, also, has been evident through giving each responsibility to host National Public Holidays thus exposing such regions to the whole world. The long hours, queues and distances spent by Kenyans seeking crucial services from Nairobi have now been made easier and faster what with the advent of Huduma Centres across the country. Education has been made a lot cheaper and unemployment reduced by an effective National Youth Service (NYS) where the Opposition was only incensed with alleged plunder but looking aside not to appreciate the over 100,000 community youths engaged in various income-generating activities. It has been expanded from 4,000 to a capacity of 30,000 young men and women undergoing various vocational training thus solving un-employment and reducing dramatically the crime rate. What is a Leader without a slogan to be remembered for? Nelson Mandela emphasized the urgency and importance of educating the African child. Winston Churchill was passionate about issues of protecting the British Empire Supremacy while Martin Luther King, Jr. desired an equitable society where all African children can prosper insisting on the need for a racist free society. Uhuru just like his fathers who gave us Nyayo and Harambee has given us our own African heritage in brighter words “Nyumba Kumi Initiative.” Reviving socialism and movement of people means more interactions and thus more business.